Your Buccaneers officially signed off on huge expectations for the 2019 season. Not every NFL team takes that approach, and one Hall of Fame general manager thinks it may not be a wise move. As a Tampa Bay season ticket holder, Joe gets all related correspondence associated with that status. In Joe’s mailbox yesterday arrived a letter from Bucco Bruce Arians. It was nothing Arians hadn’t already said, but putting it on paper and sending it to arguably the team’s most dedicated supporters is another level. The Bucs are managing expectations — big ones. They’re basically telling fans to save their money for playoff tickets or feel free to be disappointed. The Buffalo News recently wrote a story about how the Bills have been sending fans be-patient-and-grow-with-us messages, and retired Hall of Fame GM Bill Polian likes the approach and the openness. “The strategy is to make sure that the fans understand what the philosophical approach is and, as closely as you can, what the specific approach is toward rebuilding the team,” Polian said by phone. “The fans deserve that. It’s both good business and smart public relations. And it gives them a framework with which to view free agency. After all, it’s Sean and Brandon that are going to set the tone, not some commentator on the outside. The Bucs, apparently, also are sharing their internal approach to fans who have endured back-to-back losing seasons under the same team architect: Win now by making every aggressive move possible. His attack early and often game plan will change when the degenerate turnover machine does his usual on and off the antics. I have had season tickets since 1978. Not going to renew mine. Tired of paying full price for pre-season games. Better off watching from home or buying tickets for individual games for the more attractive games. Two great seats on the west side 35 line yard line will be available. Hope someone enjoys them. 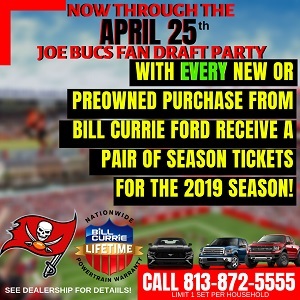 Wow, what a newsflash Joe … Bucs’ management is “basically telling fans to save their money for playoff tickets or feel free to be disappointed”. Telling Bucs’ fans to “feel free to be disappointed” is laughable. As if we’ve never been that road before? Ya right. Heck we OWN THAT ROAD. If…and only IF one could actually take Bruce (and company) at those words of being “aggressive in every way possible”, well then naturally that would portend a likely ardent pursuit of Lev Bell, or Kareem at a minimum, plus one as yet unknown real CB via trade probably. None of our other positions really require glaring immediate “aggressive” attention, but those. Yes, some attention elsewhere, but not direct immediate home-run attention. They BETTER START doing something. Others are. Nothing on the Bucs’ transaction tracker. Get to work. (Publicly). B.A. is trying to drum up enthusiasm on a drum that needs banging. take a different tack or tact? I can’t count the number of times I’ve had someone tell me they caught a typo I missed: I wrote, “take a different tack” when I must have meant “take a different tact.” I’ll admit I sometimes miss typos, but that’s not one of them. It’s possibly the most widely misused phrase I can think of. Hum… and Licht is still the bucs gm! Bucfan hates aggressive football they prefer conservative ball control that fails…. bucfan prefers to lose 6 to 9 so they can call failure glory years…. The power of negative thinking. This blog continually entertains me. There is the most negative human being I’ve ever read…TMAX…leading the chorus…but he has plenty to sing along with him. My SIL is literally certifiable. When we commiserated with her hubby he retorted…yeah it was tough but imagine what it’s like to be in her head. This is what I think of now when I read TMAX. I do not get upset…I feel sorry for him. Imagine what it’s like to be in his head…all that negativity and name calling…sad. We are fans guys! Again…nobody is suggesting heading to Vegas and placing a big bet on us in the playoffs. But there is literally no reason we can’t make them. We coulda…shoulda…woulda made them in the past couple of years if we didn’t have the dumbest, stupidest team in the league. Our brain dead penalties…well you guys know the script. Nobody nationally has noticed the Bucs since JW’s rookie year and a small notice when he had his whatever in AZ. That’s pretty much it. Now we are finally getting some positive thoughts nationally and we have folks here working their arses off to try and kill it. I get that people are peoed about our record since the SB…get the f over it. Crying about the past does NOTHING for the present or the future. And so bask in a very rare instance when YOUR Tampa Bay Bucs are actually getting some positive coverage. Enjoy it. I surely do! Watching BA at the Lightning game last night…seeing his interview between periods made me fantasize. What if the Bucs could be like the Lightning…making the playoffs EVERY year and genuine threats to win it all. I had season tickets to the Lightning when they were truly embarrassing…every bit as horrid as the Bucs this past decade. Empty seats…most exciting thing watching the jumbotron for the humorous features and crowd shots….and now…the best record in the league and a dominant team. I think JW will truly prosper this season. If you believe his head is still in the wrong place then you’re going to be a doubter and I get that. As for his talent simply look at his final six games. Did you guys watch those games? JW had 11TD’s and only 3 ints. We can win with that ratio if we simply play defense. The pressure is on Todd Bowles…not JW and Leftwich. The offense simply needs to pick up where it left off last year. Fortifying the OL and finding an RB will only help. AGAIN…go to youtube and the Atlanta game and look at those two dimes JW tossed to ME and Godwin right at the edge of the endzone where only they could catch it and the DB had NO play to make. One was from 40 yards out the other from 20. Pittsshore…what are Jameis’ usual antics? Considering his last incident was 3 years ago, does that qualify as “usual”? I cannot miss out on this season !!! Jameis is electric on the field can’t wait to cheer him and the Bucs on give us that 12th man again!!!! This win now and “we have the talent to win”…..is protecting Licht……Licht saved his job by hiring Arians…..and Arians is returning the favor by taking the win now mode…….hopefully, he is right. But, it sure seems like Licht has failed miserably with the talent…..we are in cap trouble because our draft classes from Dominick & Licht have been poor and not produced enough starting talent & depth to win. Arians may have to do this entirely by good coaching…..we’ll see. I love how the ignorant folks just write off Arians before he and his staff have even had a chance to work with the players. A sales letter should not be taken too seriously. I hope BA surpasses all expectations however, he is saying this because he can. He has every reason to retire, again. And after “whispering” to #3 for a year, he’ll have even more reasons! @Joe: I would expect any Bucs HC to cooperate with ownership and pimp season ticket sales. Don’t get me wrong. Arians is the best hire since Gruden was given the apple and roadmap. I’ll refer you to CB’s Law of Rhetorical Economics #1: The reason “talk is cheap” is because the supply exceeds the demand. I love the approach BA is taking. The seeds for culture change are being planted as we speak. The evening shadows are lengthening on the day of indifference and apathy. I have fully supported the hiring of BA since his name was first mentioned, and nothing has happened so far to change my mind. I’d much rather they send out a letter saying the Bucs are the biggest losers in the history of sports (that’s a real stat by the way) and you shouldn’t expect much, so cancel your tickets and wish the Saints the best in the playoffs, like Dirk did at the end of the 2017 season. Nah, I’d rather have someone say we’re going to win now or there is going to be hell to pay. But man, show a little personality and people panic, because what if they can’t do what they say they can do. So what! It’s entertainment, I want to be entertained, and that means putting on a show. If you’re a loser franchise who isn’t winning you had better do something to get people involved and invested and paying attention. Or they can just be quiet losers, go 2-14 and move to London in a few years when the average attendance creeps below 35,000 a game. Didn’t Dirk Koetter send out a letter too? I refuse to be negative…but after all the years of crap, I need to recharge. Year after year, we hear the same things. And we did get better under Koetter…there is no denying that, not honestly. The wins don’t show it, but a lot of pieces are in place. But I am sick and tired of losing, and I am sick and tired of having smoke blown up my nether region. Your stuff on GMC would be so roundly laughed at by virtually every person who works in the NFL. But I get it…you know more than the rest of the league. It’s one thing to say you know more than we posters…a possibility…but the entire rest of the league…not really…and not reality.